Austin "I just don't know why she's going rogue. I think its because she's off her meds"
1:30am HOH room – Jeff comes up to the HOH room to talk to Vanessa. Jeff says I just wanted to see where your mind was at. Vanessa says that she is being bombarded with massive amount of information and I want to make the right decision and not persecute the wrong person. If Audrey does go home I am not 100% convinced that people haven’t been opportunistic. If she does go home I don’t know if I could live with myself. I’m not sure she has personally wronged me and I’m sure she’s not coming after me. I am on the brink of doing something that I am not sure I’m okay with. Jeff says honestly I’m a little unbiased because we have a deal this week. I feel like I can talk to you openly because I am obviously safe this week and we have a deal where I am going to make sure you and Austin are safe next week. Audrey and I had a deal since the beginning and she had a deal with a lot of people. Like final 2 type deal. She never had a final 2 deal with me but me, her, Clay and Shelli were supposedly supposed to work together since the beginning. I’m sure you know there was an alliance in the beginning with 8 people where they kicked out Clay and tried to bring me into it. Audrey has 100% made up numerous rumors that have affected me and others in the house. She is really good at speaking to people. She is highly manipulative. This isn’t a personal attack. I actually like her as a person. She has wronged people in this house. It might be more than that, she might be America’s Player. At the end of the day who else would you pick. Is there someone else you would be okay with sending home over her? Vanessa says yes. She brings up the time she knows that James lied to her about his reasoning for putting up Jace. Jeff says I wasn’t a part of that on day 2. I was brought into that later. Jeff tells Vanessa that America always votes on things and if they’re not voting on havenot food they’re voting on something. He says he thinks Audrey could be America’s Player. Vanessa says clearly theres a group working together that I’m not in. I really don’t know what the right thing to do is. Jeff says that sending Audrey home is your best bet. Jeff thinks it would be a unanimous vote. Vanessa disagrees and thinks she might not even go home. James joins them and Vanessa asks to talk to him alone. Vanessa asks him was the plan always to evict Jace? James says yes. I asked you and you said absolutely not and said that it was Audrey that convinced you. Clearly you lied to me. James says yes. Vanessa says good. I am glad you aren’t lying to me now. It angered me that you lied to me then and threw Audrey under the bus. It concerns me deeply that people are willing to throw Audrey under the bus opportunistically. Vanessa says if I’m going to send someone home its going to be for a reason and reasons against you. Vanessa says I don’t know why you lied to me. I don’t know I was an enemy to you or why I was the only one to not know. I have a personal problem with you lying to me. James apologizes to Vanessa. There was a lot going on and a lot of people were saying things. James says do what you need to do. If it sends me home then.. Vanessa says I appreciate your honestly and I’m sure I’ll get some clarity on it. I am not mad at you and there is nothing else you can say. 1:50am – 2:20am Havenot room – Jeff asks who is she (Vanessa) going against because its not Audrey. I told Vanessa if she goes against what the house wants, that’s not exactly a good decision. I think she is going to blindside James. I almost want to tell her to just put up Audrey and let the house decide. I swear if she tries to backdoor me or throw me up there.. I am going to be pissed!! Becky says even if she wants to go after James how would she even have the votes to do it. Jeff then heads to the storage room with Jason. Jeff and Jason patch things up. Jeff, Jason and Clay talk about Liz. Jeff says that the other Liz told me she was on to them questioning her and need to stop. Jason tells Clay that Vanessa might not put up Audrey. They head outside. Jeff says she could be after me. I don’t want you guys to loose your sights on one thing. I don’t want you to get the wrong idea with me hanging out with Austin. I was afraid he was going to get HOH. Jeff says I don’t think Austin even wanted to stay HOH. Jason says he’s stupid we all know he’s not just working out. Clay says I’m uncomfortable with Audrey still in this house. James joins them. She is upset with things I said in the beginning of the game. Austin joins them. Jeff asks Austin has Vanessa’s target shifted from Audrey? Austin says absolutely not. Austin says she is over thinking everything. James says she said she doesn’t want to send a transgender home. I have no problem sending home another gay person. This is not gay pride. James says I should have said I’m the first hill-billy asian. Jason says I am not afraid about that. Austin says how do you know she’s a transgender any ways. Austin heads inside. Jason tells Jeff that Austin was lying right there. When you said supposedly James is the target now. He already knew that. Shelli joins them. Jason tells James you need to not do what Day did. You need to relax. Jeff says that Vanessa believes that Audrey has the votes if she was up there. Jeff says if she put up me or Clay up, it would legit be a bloodbath. Jason says I don’t think she would put up Clay. Clay says she would probably want to split up Shelli and I. James says the only other person logically is Jeff. Jeff says she doesn’t want to send someone home from a protected group. Jason says I knew people would think that. She’s just another person in this game. 2:25am HOH room – Vanessa fills Austin in on the conversation she had with James. She tells him that James admitted to lying to her. He didn’t try to manipulate the situation. Austin tells Vanessa that Jeff is out there telling people we all need to go up to the HOH room and tell her (Vanessa) if she doesn’t put up Audrey you are done next week. Audrey joins them. She says that Jeff is down there revolting. Austin says that Jeff, James and Jason are out there leading it. If they come up here do you want me to call Jeff out. Vanessa says yes. Austin asks who is the target James or Jeff. Vanessa says still James for me. He told me to go with your gut. My gut tells me don’t put Audrey up, don’t trust James. Austin says that Jeff is the one down there flipping out. Audrey says that Jason is going to unravel. 2:50am Gronk Party music plays and he says lets get a limbo party going in the backyard! They grab the pool cue and all line up and limbo. Get the live feeds for ONLY $5.99 TRY them FREE for 7 DAYS! 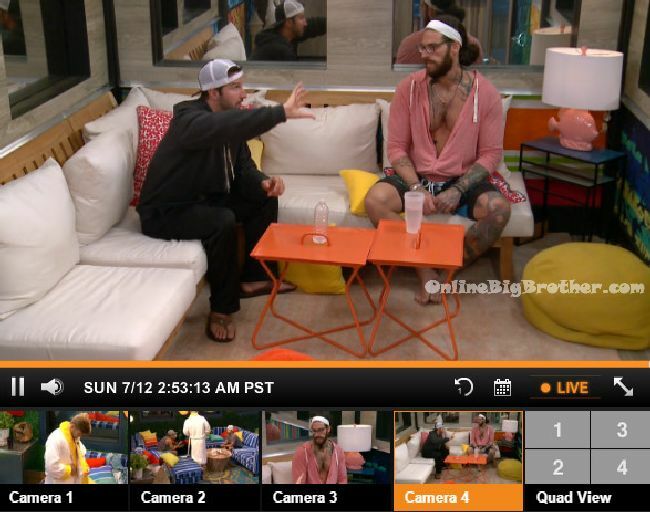 2:50am – 3pm Cabana room – Austin and Jeff are talking. Austin says I told Vanessa to stop and just go to bed. We’ll talk tomorrow. Jeff asks did you tell her about the twins? Austin says no. Austin says I am going to try and talk to her (Vanessa) again when she’s had her meds again. I just don’t know why she is going rogue. I think its because she’s off her meds. Jeff says we need Vanessa. How are we going to work with her if she goes rogue. Austin says this throws my whole game off. Jeff says the house is so on board with getting Audrey out. Who does she want to put up? Austin says I don’t know because Audrey was up there and I couldn’t talk to her. If you try and do a house meeting up there it wouldn’t be good. She’s too volatile. Jeff says I’m not trying to start a house meeting, that was others out there. Austin says I don’t think she is thinking clearly. Jeff says why doesn’t she just put them both (Audrey up with James) up and let the house decide. I am just going to let her go with her gut. I’m not going to keep going up there and talking to her. Her and I have a deal so I’m not worried about it. Austin says okay, I’ll tell her all this. Austin says she might put up Jackie. Who do you think would go home in that situation. Jeff says probably Jackie. Austin asks what if Audrey is just here to cause discord. Jeff says I’m going to leave her alone and hope that I didn’t piss her off. 3:10am – 3:25am Cabana room – Jeff and Clay are talking. Jeff says Audrey has to go immediately. Clay says think about if you were HOH .. you don’t want people telling you what to do. We need to make her think that Audrey going home is a priority. Jeff says dude Audrey preys on the weak. She preys on the weak. Jeff says Johnny Mac is our secret weapon. Lets get Johnny Mac to go talk to her. No one would ever suspect us to be working with Johnny. Jeff says do not say a word about the Jackie thing. If they throw me up, dude we are going to have to go to war. Jeff says Audrey is a witch, she’s a witch! Jason says she needs to be burned at the stake. Clay says we’ll see where she stands tomorrow. Jeff says Vanessa is a very scary player because she is not a good player. Austin is sketching me out. I think there’s a 20 – 30% chance they’re going to vote me out. Jeff says why do I get the feeling she is going to put me up. Jason says I’m afraid she’s going to go for you. Clay says she won’t want to get more blood on her hands. Jeff say Austin is acting super sketchy. Jeff says we need to take her and her broomstick and send her a$$ out of here. They leave the room. Jeff asks Clay do you think worst case if I go up against James do you think I would stay? Clay says I think so. 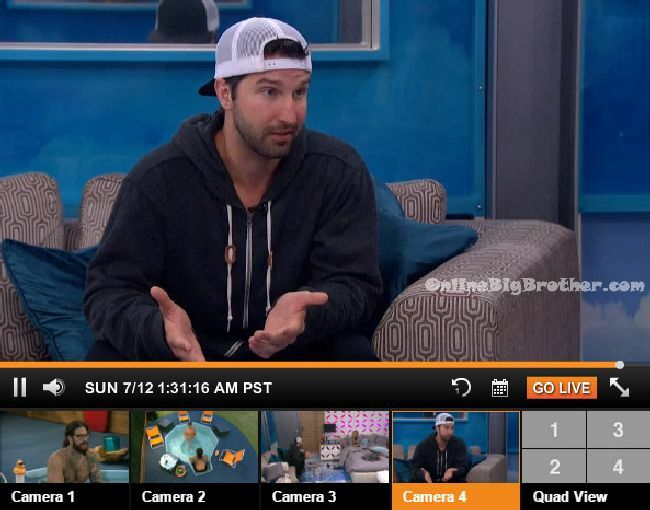 3:30am Backyard – Shelli, Becky, James, Jeff and Jackie are talking. 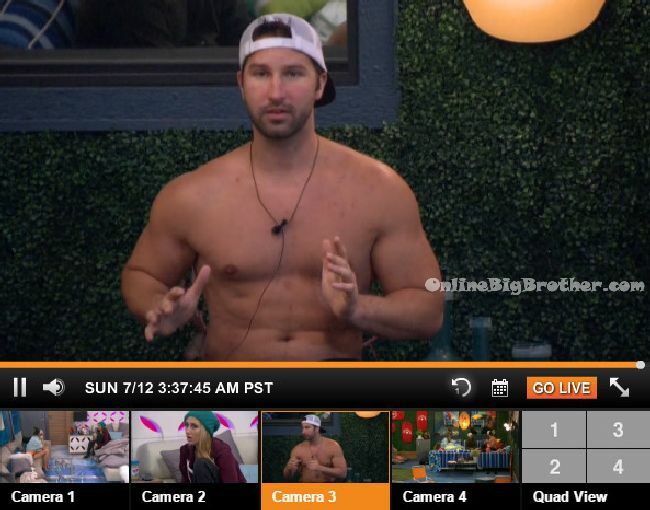 James says I think Austin is saying he wants to get Audrey out but he really wants me out. Jeff says this has to be completely no agenda pushing. Maybe no talking about Audrey. We need to use smoke and mirrors. We have to go back to sales tactics 101. Jason says I know you’re a lesbian and I’m a gay man but her being tansgender has nothing to do with anything. This isn’t a cast full of bigots.. no one cares. Jackie says she already makes it seem like we’re bullying her. Jeff asks who can we get put up? 3:30am – 4am HOH room – Vanessa tells Audrey that best case if Jeff throws a fit I know how to handle it. He will end up looking really bad if he tired to bully me. Vanessa asks what can you offer me if I help cover / redeem your name. Audrey says obviously loyalty. If I win HOH or Veto I am always going to talk. Right now I’ve got nothing besides trying to prove myself to you and our group. Vanessa says I think you’re going to go far in this game. My concern is that sleeper cell can go deep. More so than any other group of 5. We’ve got the best shot. Its no secret Shelli and Clay will have their back over anyone else. Audrey says to be honest I would be more loyal to you and Shelli. Vanessa says I think you’re going to go far. If I got to top two with you, you are a favourite. I’m okay with second. I’m not a money orientated person. If I was I would still be gambling. Vanessa asks would you have a conflict if we got down to final 4 would you take me over Shelli. Audrey says I don’t think so. Austin joins them. He says f**king Jeff. He went outside and Clay came and told me that I was acting weird. Vanessa says well call him out. Austin says I just told him I your boy, I’m your boy and then right after he goes out and does that. They talk about Austin calling out Jeff. I really hope Jeff goes up and James gets voted out. I really want to see a week of Jeff scrambling. I don’t care for Jeff, but I do want him to stay in the house for the chaos factor. The sooner they figure out Clay power jumped the sooner this will get good. Eh, I’m fine with it. I don’t think we need a ginormous, game changing twist every week because then the season will end up just being a giant crap shoot. Look at BB Canada 3: yes, they got lucky and ended up with a good winner, but there were way too many twists and it became a big game of chance. A few goofy, inconsequential takeovers here and there are fine. They keep with the season’s premise without taking from the integrity of the game. lucky? its because of the game changing twists that she ended up in the final 2. Da was spot on. They are afraid to put her up because she is transgender. I agree. I didn’t think she was right at first, but now I do. Lame. Do they just want to hand Audrey $500k because she’s transgendered? That’s ridiculous. 6 people gave you the thumbs down even though Vanessa admitted it and Day did say it. These are facts but yet you get 6 thumbs down? LOL!!! Figure out clay is the andy…please. Simon and Dawg I just want to commend you guys on removing inappropriate comments. As per usual you guys do a great job and I imagine it must be difficult to keep with all the comments as well as doing the update. Donation to come soon.